How It’s Gone So Far, and My NEW WRITING SPACE! Your comments were digested after much rumination and were IMMENSELY helpful; the lack of reply was down to my blogging/gaming PC being dismantled since Saturday (more on that later). Now that I have the chance to acknowledge you properly, thank you all. If you’re ever in Sydney I owe you a beer. (remind me to write a post about how buying an ipad has been the best reunion with iOS imaginable), allowing my technologically challenged wife and infant daughter to talk / squeak-and-wave-arms at me. It has also been fantastic for my writing, since I also bought a tiny bluetooth keyboard for it. 2. A good night out. Or two. Or three. I had a pretty good one on Friday, with a late stagger back through the rain, but there were no spirits involved (unless you count soju, which for this one you really shouldn’t: chamisul is only about 20% ABV). The company was true. There was late night snacking. On the Saturday I LANned at a good mate’s place and we bashed Diablo whilst consuming tasty Korean beef and drinking James Squire. Monday night I had a bottle of mead with friends over dinner. The simplicity of: get up, get washed, get tea, answer email, walk dog, get coffee, do work, cook rice, etc. etc. This has been great for feeling relaxed, and it doesn’t matter so much what time you start, just so long as you go through the same routine. So all in all, I’m doing good now. I maybe-just-possibly had one sadface moment when my Tim Minchin Youtube playlist rolled over onto White Wine in the Sun. It was the line about passing the baby girl around the room like a puppy at a preschool. The damn funny-guy caught me off guard. Ahh well. No plan is perfect. So, with my new computer parts installed, a new computer desk to put everything on, and finally the problem of where I’m going to do my writing (in a noisy, distracting-ful house) HAS BEEN SOLVED! 1. Nobody uses the bedroom during the day anyway. It’s an empty, unused, lockable and secluded space except during sleeping hours, which makes it perfect for writing. 2. It costs nothing and requires no modifications to anything. 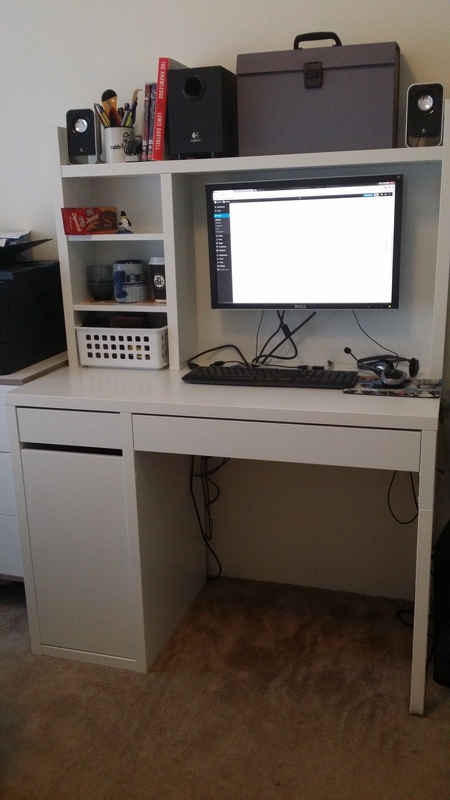 I bought a new IKEA desk, because I didn’t want an old ugly desk in our nice bedroom: I wanted something that hid the cables, was compact, was white like everything else in there, etc. The thing is though, I didn’t have to buy anything, I could have just simply moved my desk and hey-presto, writing lair complete. Nothing encourages work like a neat and tidy desk, free from distractions (with the exception of perhaps trinkets and pictures, because I needs my trinkets). Nothing encourages a neat and tidy desk like your wife having to look at it every morning and judge you, with her judgiest judgement face. It’s a synergistic effect, with guilt feeding into productivity, and synergy is good apparently. How is your writing space looking for you, and what’s working / what’s not? Anyhow, that’s me for now. Looking forward to getting a lot of writing done this weekend since I’m locked away in a foreign country (work trip). A Clinical Research Associate by day (google it), writer by night, D.R.Sylvester lives in Sydney, Australia with his patissiere wife and Siberian Wolf. His interests include travel, music (predominantly Metal), reading, & archery. This entry was posted in Thoughts, Writing and tagged anxiety, facetime, home office, office space, productivity, Writing. Bookmark the permalink. 7 Responses to How It’s Gone So Far, and My NEW WRITING SPACE! Great job! And lovely workspace. Looks great! I can almost you reaching a multitude of word count goals here. Ever tried writing via stand-up desk? Ha, you’re right, the stool/leaning post does take up too much room, though you should be more worried about the Cirque du Soleil-esque posture you’ll adopt if you use it too much. I use a combination of a standup desk and a desk space similar to the one you have. The second monitor is the laptop, which is easily transported between each setup. If you do get a standup desk, don’t use the stool/leaning post if you can help it. I personally like the standup desk because it quickly gets you in the zone to do some serious work/writing. Just use a cushion you can step on (i.e. : a sofa cushion) and walk around or rest every hour or so. I LOVE Ikea, haha. The desk is great. Is it enough, length wise, to provide comfortable hand resting while typing and writing down things? Maybe it’s just the picture but it looks a tad short. I’ve just updated my writing space and like it as well. I have this huge desk that’s more like a little table. Perfect to lay sticky notes and notecards out! How to Find the Fat in My Manuscript? © 2014 Writes & Responsibilities: D.R.Sylvester Fiction. All rights reserved.